Platinum prices climbed to $1,800 in their two-year rebound following 2008's financial crisis. 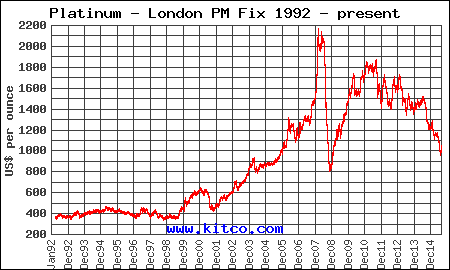 The crisis sent platinum all the way down to $800 by December that year – a 64% plunge from its all-time high of $2,250. But since 2010, it's been mostly a long grind downward as the global economy struggles to eke out even minor growth. Platinum prices have cratered on weak demand. In order to stem the tide, some of the world's largest producers of the precious metal are cutting production. A report released Aug. 12 by the World Platinum Investment Council (WPIC) gave investors a look at where the platinum market is headed. WPIC said platinum production in South Africa, the world largest producer, will drop by 600,000 ounces next year – a massive 16%. That brings the country's output to 3.4 million ounces in 2016 versus an expected 4.06 million ounces in 2015. In fact, capital investment has fallen 63% since 2008 as platinum output has declined. That's $1.5 billion of funds to operate that simply didn't get invested. In a few years, that lack of capital will manifest in severely challenged supplies when demand is forging ahead. One producer alone, Lonmin, said it would cut production by 100,000 ounces annually. And then came even more sobering news. According to Bloomberg, Glencore Plc. (LON: GLEN) will shutter its Eland platinum mine, also located in South Africa. Glencore produces platinum from two mines in the country for a total of 157,000 ounces annually. So closing one of its mines will make a huge dent in production. In North America, Stillwater Mining Co. (NYSE: SWC) announced it will lay off 119 workers (7% of its total workforce) in an effort to rein in production costs. The platinum and palladium producer had already cut its workforce by 9% over the previous year. So what does all this mean for the platinum market?